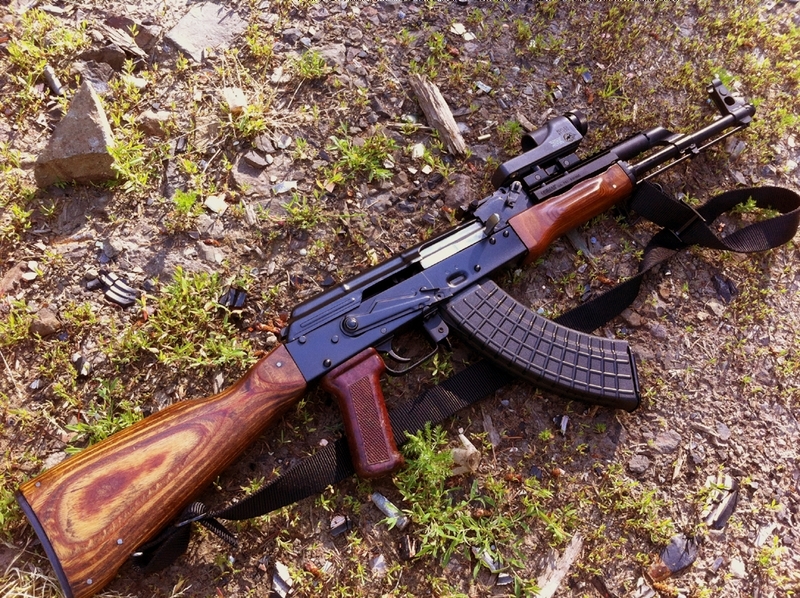 I posted a thread somewhere about somebody who went to extremes in accurizing an AK, but I can't seem to find it. In that thread, Schuetzenman pointed out the rear sight bounce (shown in video below). Obviously when the rear sight bounces like that, it's not going to hold zero. But just as a little experiment, I placed a 7.62x39 laser bore sight in my chamber and looke down the sights. I then flicked the rear sight up an let it fall on its own a few times. I was amazed at just how noticeable the change of the position of my laser in relation to my front sight post was. It got me thinking. What if instead of using a leaf sight sitting on a springy piece of steel and "drum" sliding up a ramp to adjiust elevation for range the rear sight sat on a ramp that was permanently fixed in place, and you simply used a button similar in style to what is used to move the drum to move the rear sight forward and back on the ramp with a guide rail keeping the sight fixed from moving vertically? I've looked everywhere to see if this idea had ever come up, but I'm coming up empty handed and product search shows nothing. Duct tape it down. Or some really heavy rubber bands do help. What you describe would be very difficult to change elevation on. It would work but would require a lot of effort to change the elevation to compensate for range changes. You'd be stuck with having to guesstimate elevation hold over or never take a shot until you closed the distance to your zeroed elevation. Last edited by Schuetzenman; 11-21-2013 at 10:48 PM. I've never been able to shoot well with the stock rear site, but after installing a Mojo sight things changed for the better. As far as the sight flopping, it's never been a problem since I'm not shooting FA. Now that my eyes aren't working so well up close, I've had to go with the red dot option. Not sure I like the look of the Trijicon up front and I may go with something much smaller when I get some $$ set aside. That is very close to how my SAR1 used to be setup. I used to really like my triji reflex and how it functioned on there, 10 years ago. Now it is a pile of dim reticle garbage. After the tritium half life hit it just went downhill fast. I can barely see my chevron indoors now and it really only works outdoors on a sunny day. Other than some of the micro red dot sights though the triji was the smallest option available. I tried an aim point on my ultimak rail and it was way too goofy looking and large. Good luck finding a suitable replacement for it. Now it is a pile of dim reticle garbage. After the tritium half life hit it just went downhill fast. Send it to Trijicon to get the tritium capsule replaced. I would think it wouldn't be too expensive since they manufacture them by the gazillions and it should glow like new afterwards. Rubber bands, maybe. The ranges would be marked on the ramp just as they are on the leaf sight. After a lot of bullets were spent finding the ranges anyways. The idea was to keep a setup familiar in use, still adjustable for elevation, without all the vertical bouncing. You'e right about it being difficult for sure, but I'm thinking it could make a nice mod to the iron sights.